Jim was one of the really good guys – nobody ever had a bad word to say about him. A superbly talented athlete over a whole range of distances as outlined below he is indeed a Great Scot! The article is from the Scottish Marathon Club magazine from 1985 and is one of a series on Great Scots which included Chic Robertson, Alistair Wood, Don McGregor and others hence the title! “Jim Dingwall can by any standards – titles won at several distances, times turned in at any one of five distances, international vests won – be classed as a great Scottish marathon man. He must be included in a series such as this when others who have done only a couple of fast times, or won one SAAA or AAA Championship would maybe not come within the scope of the series. Jim was born in Edinburgh on 30th May, 1949. A pupil at George Heriot’s School where Donald Hastie was head of Physical Education saw him hooked on athletics from the early 60’s, his mother encouraged this interest and by the time he went to Edinburgh University in 1967 he was already running the 880 yards in sub 2 minutes 02 seconds and had been third in the Scottish Schools Mile. At University he was contemporary with Gareth Bryan-Jones, the Wight brothers, Blamire, Logue and Andy McKean. He learned from them even though he says “on a good day I could just about make the fourth team.” This situation did not last for long however and he was soon a vital member of the great Edinburgh University team of the time. At University he worked at his running and by 1969 was under 4 minutes for the 1500m. 1970 saw him run 3:51.2 at Durham. In 1972 he joined Edinburgh AC while still at University and run pb’s of 3:46.2 for 1500m and 14:12.8 for 5000m on consecutive days. Progress continued at an alarming rate and in 1974 he had bests for the season of 1:56.1, 3:50.2, 8:10.6 13:55.2 and 29:43.4 and in the process he won the SAAA 10000m. The ironic point is that in season 1974/75 he established a record by NOT winning a medal.. In the national cross-country championships at Coatbridge the EAC team won the team race with our hero finishing 13th and out of the medals since his team mates were placed 1st, 2nd, 5th, 8th, 10th and 11th! He is the hiighest ever placed non-counter in the championship. Next season on the track, however, he was back to his best form setting a Scottish native and all-comers record for 3000m of 7:57.8 and pb’s of 13:48 (5000m) and 29:42.6 for 10000m. It can be seen from these figures that like Alastair Wood and Donald Macgregor, Jim had a considerable track record before turning to the marathon. In 1976 he left Edinburgh AC and joined Falkirk Victoria Harriers and simultaneously turned his thoughts to training for and running the marathon. His first thoughts of running the race were in the early 70’s when he was racing and enjoying 1500’s and in 1972 he actually ran a late season marathon when the track season was at an end. He ran 2:27:47 in a pair of heavy trainers and was sure then that he could do sub 2:20 with proper training. He himself reckons that his track performances up to 5000m started to decline when he started to train for the marathon but the figures don’t exactly support this. His first really good marathon however, was on 26th October, 1974 when he was fourth in the Harlow marathon in 2:19.01. Gentleman that he is, he later apologised to Colin Youngson who had finished eighth in 2:21:06 because he knew that Colin had been trying to break 2:20 for some time while Jim had done so with no bother at all! In 1976 he won the West District and SAAA 10000m titles and was third for the third consecutive year in the SAAA 5000m before he went down to the AAA Marathon in Rotherham where he turned in 2:26:00. 1977 however was a real turning point in his career. He ran 2:21:37 at Rugby, then after two hard 10000m races in three days (in one of which he set a pb of 28:55.2) he won the SAAA Marathon in 2:16:05. His track season that year included 1500m in 3:50.6, 3000m in 8:01.1 and 5000m in 13:59.5 and he retained his West and SAAA 10000m titles. 1978 was Commonwealth Games year in Edmonton and Jim ran well enough early on with 28:45.3 for 10000m and 2:13:58 at Sandbach to qualify for the Games. On the day of the race (11th August) he led to the half-distance “and then the roof fell in” (his phrase!) His finishing time was a lifetime worst of 2:32:54. However he had gone as the only Scottish representative, run in very hot conditions and given it a real go – it was not a miserable tail of the field type run although he was naturally very disappointed. In 1979 he was fourth in the SCCU Championship and selected for the World Championships; during the summer he ran 2:20:18 at Boston in April and 2:15:45 at Milton Keynes in September. By 1980 he was running 5 marathons in one year with second places in SAAA, Aberdeen and Bermuda and wins at Le Quesnoy and Glasgow where he ran 2:16:07. 1981 began with first place on 4th January in Israel in 2:16:19 and this was followed by 2:14:54 in London. After being third in the SAAA 10000m for the third year he went on to be fifth in Bermuda and also in the AAA race at Gateshead in 2:15:30. With this kind of form over the last three years he could maybe be forgiven for looking for a place in the team for the Commonwealth Games in Brisbane. he reckoned without the SAAA selection procedures. Like many others he was led to believe that the AAA’s race was to be the qualifying race as it had been four years earlier at Sandbach. Imagine his dismay on learning that he was not in the team but that Graham Laing whom he had beaten at Gateshead was. He could be forgiven for feeling a wee bit bitter. His reply the following year was to run a lifetime best of 2:11:44 in London for the marathon where he was fifth. On paper this was his best run but he was left without the feeling of euphoria that normally accompanies such a performance. To explain a bit, having had a cold for the three days prior to the race he had not slept well, and then on the day he had lost a lot of ground on the cobbles at the Tower at 22 miles. The resulting feeling was one of frustration as he felt that he could have gone even faster although he was pleased with the time. He also ran in Hong Kong, Laredo, New York and Bolton in 1983. 1984 saw him running in Hong Kong again where he ran 2:20:43, and London where he turned in 2:29:28. He is now living in Hull and that has been a bit disruptive. He can no longer (he feels) justify putting so much effort into his running and and is currently doing only about 60 mpw. Not only has his training been upset, but his career as an enlightened SCCU official has also been terminated for the time being. He does however have the intention of returning to athletics administration. After that brief resume of his career so far, let’s have a look at his thoughts on a couple of topics. As far as training is concerned, he feels that we are limited by our brains rather than our bodies. At the time he turned to marathon running he felt that he was unwilling to increase the amount of speed training he was doing and that without that increase he was not going to improve. The type of training for marathons is not felt to be very important provided some simple principles are kept. There should be some long runs, ie over 15 miles, and there should be some runs at faster than race pace – fartlek, shorter races, etc. Training must also be consistent, not only miles per week, but also miles per year. Jim’s lowest total since 1972 is 1990 which itself is an average of 77 mpw. A lot of people train hard for a few weeks and then ease off. This approach does not make sense to Jim. The basic principle is that the harder you train, the fitter you get – provided you don’t break down physically or mentally. The difficulty is getting it right for you. Train too easy and you don’t reach your potential, train too hard and you get injured or depressed. It is also wrong to adopt another runner’s training in its entirety – people doffer in talent, personal circumstances, objectives, etc. As far as The Diet is concerned, he has done it a couple of times and run badly in the resulting race. While accepting that it does increase blood glycogen, he doubts whether many people can stand the side-effects and suspects that most people who did The Diet ate significant amounts of carbohydrate during the depletion phase. He himself does a slight depletion at the start of the last week – reduced carbohydrate to compensate for the reduced training load – 1 potato instead of 2, 1 spoonful of sugar in coffee instead of 2 and so on. He also indulges in a carbo loading meal the day before the race. The only dietary idiosyncrasy is that he eats a sandwich about 2 hours before a marathon since he gets a stitch if he runs on a completely empty stomach. When it comes to assessing one’s best performance, the big boys can’t do it without arousing a bit of controversy. As explained above, Jim’s fastest marathon left him feeling a bit frustrated; he places a higher value on his SAA win in 1977 since it convinced the sceptics that he had been right to move up from 1500m/5000m to the marathon. He also feels that his most pleasing run was when he won the San Silvestre Vallecana road race in 1976 since he beat four Olympic finalists on that occasion. Other than his publicly avowed aim to be the first 100 year old to break 5 hours for the marathon, what does the future hold for Jim? It is well known that marathon and distance runners tend to keep their involvement with the sport in a way that sprinters and field events athletes don’t as a rule. Well for a start he intends to go on running marathons and confesses that Ultra Distance holds a certain fascination for him. In ’78 on his return from Edmonton he ran the Two Bridges 36 miles in 3:20:55 as therapy. From there to the 24 hour race in October this year is a long way – it will be interesting to see what happens there if he decides to run. He does not see himself as a coach with a ‘herd of young athletes’: this is not decrying the work that they do but he feels that his personality is not suited to working in this area. It would be a real tragedy if his experience of top class racing in all parts of the world were to be lost to the sport and he admits that he could maybe be ‘of some use’ as an adviser of good club athletes or international class athletes. He seems to see himself becoming and administrator or official rather than a coach and from this point of view it is a pity he has moved to Hull where he does not know the scene, and where he will not be on the SAAA or SCCU committee – maybe our need is as great as Hull’s and the thought of Jim and Don Macgregor working on the already very good SCCU Committee for the benfit of Scottish athletics is an attractive one. The second feature is Jim’s answers to the SMC Magazine Questionnaire devised by Alistair McFarlane and answered down the years by many marathon runners of all standards. How did you get involved in the sport? I was fortunate that there was a big tradition of athletics and cross country running at my school (George Heriot’s in Edinburgh). Donald Hastie and John Dickson (Head of PE and in charge of cross country respectively) were probably the most important people in getting me started. What exactly do you get out of the sport? Nowadays I get friendship, a good social scene, a reasonable state of fitness for an old stiffy and a bit of cash. I can also look back on good times, trips abroad to exotic places but above all to making friends with many fine people. Running is such an honest sport – you get out of it what you put in so there is a high proportion of decent down to earth people involved at all levels. You couldn’t meet a nicer bunch of folk. Can you describe your general attitude to the sport? This has changed. Once upon a time I wanted to be a world class marathon runner and was willing to train hard to achieve that (all right – you can’t win ’em all!) Now I have a more easy going attitude. I don’t train so hard and have to accept that I won’t break my 2:11:33 pb. I do still want to be able to run reasonably well , though if the Don can still break 2:20 at 46 there should be a few years left in me yet. What do you consider your best ever performance? Winning the San Silvestre Villecana road race in Madrid in 1976. I was such a novice on the international scene and was very surprised to beat quite a classy field including four athletes who were Olympic finalists that year. And your worst? Enschede Marathon in 1977 in 2:36 odd. I thought I was quite fit before the race but I blew up at 2 Miles! I presume there was something wrong with me (I had to dive into the bushes) but I never discovered what it was. What do you do apart from running to relax? Not enough! I sing in the Hull Choral Union and our local church choir. I’m also out eating and drinking quite a bit. I’ve recently started home brewing. What goals do you have that are still unachieved? The long term objective is to be the first person over 100 years old to break 5 hours for the marathon. Gordon Porteous might have other ideas though! What has running brought you that you would not have wanted to miss? Apart from what I’ve said already, running has allowed (or forced) me to develop skills in certain areas eg public speaking, negotiating, organising events, which have been very useful particularly at work. Can you give some details of your training? I’ve done almost everything over the years from bashing two or three miles every night (in my late teens) to LSD (long slow distance – remember that?) in 1976. Now I do 50 – 70 miles per week in one session a day. I try to get into a reasonably long run (at least 15 miles) and a hard fartlek each week. I also race pretty frequently (20 – 30 times a year). I try to build up the mileage a bit before marathons – but am not always sufficiently dedicated to actually do it. I suppose that after nearly a quarter of a century in the sport I just don’t want to be a slave to hard training any more. I’ll settle for what comes. Any achievements are a bonus. The above two articles give a coverage of his racing and training and just a hint of his personality and attitudes. His personality to a large extent shaped his athletics and the obituary below, written by Alan Fowlie and Colin Youngson, who both knew him well gives a real sense of his character. Jim Dingwall was born in Edinburgh on 30th May, 1949 and died, after a long struggle with cancer, on 22nd July 2005. He was one of the finest Scottish runners of his generation and a man known for dedication, clever tactics and an open cheerful disposition which won him universal popularity and honour. Jim had a great number of friends and not one enemy, which is unusual since athletes tend to be self centred. He certainly enjoyed a night out with both club-mates and rivals. Real ale and good banter sometimes inspired him to display his singing talents, honed in the Methodist choir. He was brave, matter of fact and uncomplaining – a role model. Although his racing record and personal best times were extremely impressive, and his rivals could only respect his ability and consistent success, his greatest achievement was to remain himself – a modest, positive, generous friendly man who was always great company and an especially memorable character. 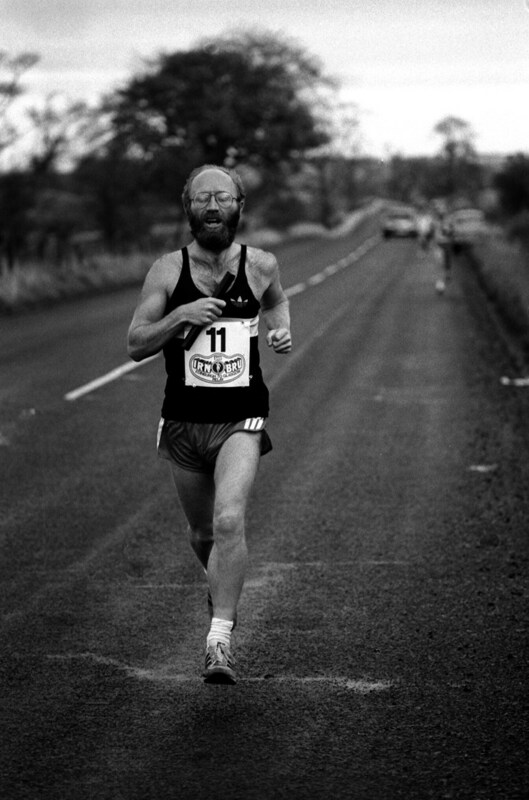 My memories of Jim (writes Colin Youngson) include many race defeats and a few surprise victories, but I will remember specially: training with Jim and his great friend Willie Day in Falkirk; the Water of Leith pub crawl; the Isle of Man Easter Festival of Running (and beer drinking); and celebrations after the Edinburgh to Glasgow Relay and the London Marathon. Jim, who worked as a research chemist with BP in Grangemouth was transferred in the mid 80’s to work at Hull (writes Alan Fowlie). He arrived there in his prime as a distance runner with 30 marathons already under his belt and wins at Le Quesnoy (France), Glasgow, Sea of Galilee and Hong Kong among others. With this pedigree, plus his impressive record in track athletics, he was understandably welcomed with open arms by his new club, City of Hull ACfor whom he filled a pivotal role for the next fifteen years. In the late 1980’s and early 1990’s, in local and regional races from 3000 metres on the track through 10K and 10 Miles on the road, right up to the marathon, the only question tended to be “Who’ll finish second to Jim?” While based in East Yorkshire he completed a further 24 marathons winning the Humber Bridge and the Bolton within a fortnight of each other in 1985. He ran 20 London Marathons between 1981 and 2003. To the unsuspecting members of his new club he introduced the concept of ‘serious training’. 100 miles a week at training camps in North Wales and Derbyshire, and Tuesday night with Kirkella fartleks converted many joggers into runners, and more than a few runners into athletes. Jim’s athletic prowess and commitment, his sociability, honesty and decency, and his infectious sense of humour all ensured that he was well loved and respected in this corner of England as he was in Scotland.